First off to those who do follow me and read my blog I would like to apologize for how late my post is. Indeed, I am extremely late. Life, you know, caught up to me rather fast. I hope this update finds all of you well and I hope you can forgive me for my tardiness! Let’s continue with Jordan, shall we? These are my thoughts during my final weeks in this new country. Jordan is scary, but it’s not scary? Often I found myself worried, concerned more than I should have. Indeed, I had rather strange experiences. For example, traveling to the grocery store was often an ordeal. I would travel, alone, by foot to the store about 1/3 of a mile from my apartment. Eyes were constantly on me. “Aren’t I dressed modestly enough?”, I would often think to myself. Alas, my failure was that I often thought of Jordan through my perspectives of Morocco. My flowing dress, with sleeves, and length below the knee, was certainly appropriate in Morocco, but in Jordan? a whole new story. The way the dress fit the shape of my feminine body, the length, reaching a few inches below the knee..this, in Jordan, was not something appropriate. Oh how I was astonished, ashamed, and confused. That’s something about me; I will not carry my Western views to an Eastern country. Proudly, I admit, I was ashamed of my mistake. Promptly I traveled to the mall with my roommates, I purchased garb that would be more acceptable in this beautiful and different culture. Expensive, but without regret, this garb served me well. I made a fantastic friend while in Jordan. She was born and raised in the U.S.A, a Muslim-American who decided to study abroad in Jordan in order to study her families language, and meet her Jordanian family members. I connected with her instantly. We shared a cute interest in the Asian culture: Japanese and Korean culture/language, Anime and K-POP/Drama, I knew the moment I met her that her and I would become great friends. Eventually, she invited myself and another student to enjoy dinner at her families home. It was Ramadan, so sharing dinner during this time was something especially beautiful and special. She requested, kindly, that I dress respectively for this occasion. I wore the new outfit I purchased at the local mall, a scarf around my neck (meant to be worn around the head if necessary) and a rather cute long-sleeved and lengthened dress. Her family ended up being rather open, so a head scarf was not needed 🙂 I had such an amazing, beautiful dinner with her family. And her family would not stop feeding me! I had fasted (not eaten) that day, so the food was so good, and I was beyond grateful to have been offered such a meal. The conversation and dialogue I exchanged with her family is not to be forgotten; it was one experience I longed for and I had gotten it! Jordan is scary, but when I am able to truly immerse myself within it’s culture, I found that the country is beautiful beyond measure. Jordan was not so scary after all. That which we do not understand: it is terrifying. Always strive to understand that which you fear, and you will find, often, it is not so scary. Okay enough of that! Let’s move on to the pictures, eh? Oh my God! I’m sure some of you have heard of Petra, right? Petra is a historical site to see. Petra often referred to as “Rose City” due to the color of the stone, was established before 312 BC. It was once the capital of the city of the Arab Nabataeans. Today, Petra is a symbol of Jordan, and one of the worlds most beautiful wonders. My necklace: I went to my universities book store in Jordan to pick up a notebook and the kind shop-owner, he offered me that necklace as a welcome to Jordan! I love it so much! Isn’t it cute? :3 It’s in the shape and the national color of Jordan! I finally had arrived in Jordan and things seemed to be going well – until the airport lost my luggage. Luckily, with the support of our amazing program director, and a little luck, my luggage was located and I could comfortably experience my first days in Jordan. These first few days consisted mostly of city and ancient ruin and historical visits, as well as orientation. Skipping the boring parts, I absolutely cannot say enough about how beautiful, clean, and amazing Jordan is. The weather has been very comfortable, and the sites to see are absolutely breath taking. Because it is Ramadan, the best time to be out is at night, when there is music, laughter, shopping, and food along the streets. I was awh-struck when the time of fasting broke, and I found myself right next to a mosque, listening to the call to prayer trickle from the mosque’s speakers. Locals handed out free tamr (date) drinks to myself and others surrounding, and I peacefully observed how locals broke their fast and experienced the city slowly come to life as the sun set and the stars began to gleam. These few days I got to go to a couple really nice places to eat, one in particular I would like to mention is called “Books at Cafe” Downstairs is a book store/library, and up stares is a beautiful restaurant/ hookah lounge. What really got me about this place, is that it is known as a place of openness, and safety to all. Jordanian, tourist, gay, straight – it doesn’t matter all are welcome. In fact, the owners themselves are known to be …well “different”. Seeing a place like this right in the heart of the Middle East really left me silent and speechless. Moving on to some of the amazing historical sites I got to see, between Amman’s Citadel, Jerash, and the amazing ajloun castle. 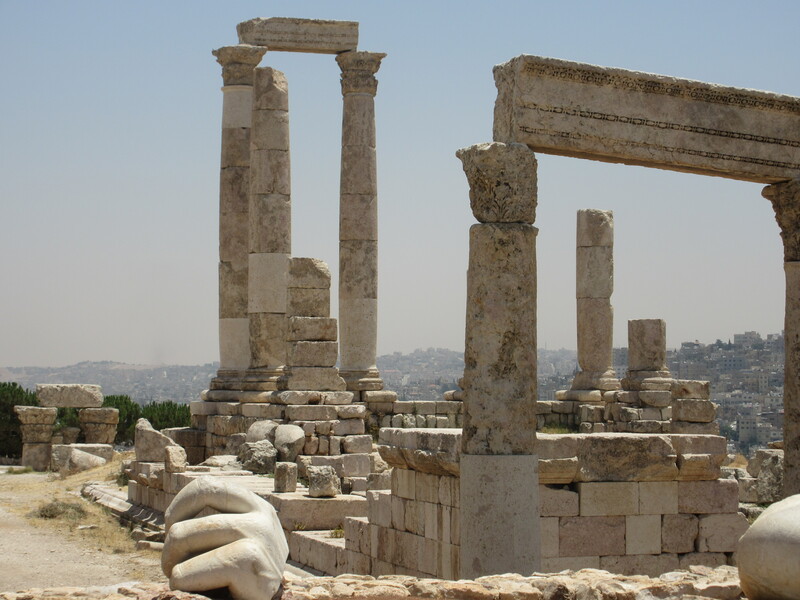 Amman’s ancient Citadel, is located on the highest hill top in Amman, known as Jebel alqala. This ancient site was occupied during the Bronze Period(3200 BC), and has been rebuilt multiple times during the Roman, Byzantine, and Umayyad (also know as More) periods. A little bit that was interesting about this site for me is that my ancestors were actually thought to be the Umayyads. The Umayyads, also known as the More’s (My last name being Moreau, deriving from More) were nomads of North Africa who ruled and traveled thorughout the Middle East, before much later migrating and colonizing in France and eventually (most recently) French Canada. . Seeing what could have been a creation of my ancestors was absolutely amazing!! The pillars you see in the picture below are known as the Roman Temple of Hercules, and yes that is Hercules’s hand. This area is also known as an area that the prophet Jesus and Islam’s prophet Muhammad passed through once long ago. Moving on, I eventually saw the ancient city of Jerash and the awesome aljoun castle. Jerash was a full blown ancient Roman city. From washrooms, residential areas, roads, walls, shopping areas, the arena/theater and fountains this city was founded 2000+ BC (exact date unknown). After earthquakes, and wars around 720 AD, this city was buried under the gravel before it was discovered in the early 1800’s. Enjoy the breathtaking photo’s I took on my snazzy canon camera. Excuse any horrible angles, editing, or lighting. I am not a camera genius but I thought I’d play around and try to capture this areas outstanding beauty. I cannot explain the feeling I had when being here. My mind kept coloring the ruins, and I imagined flashes of what the city once looked like, bustling, the smell of food, the sound of children playing among the streets. It took a couple hours to walk around the entire city. Finally, Aljouin castle, owned by many rulers, and mentioned by the legendary traveler ibn batutta, was an outstanding sight to see. This area was also once crossed by many of our world’s many holy prophets.